Richard Gere is known for being particularly selective over his roles in recent years. One cannot deny that it is a tactic that works – the past ten years have seen some of his strongest work from The Hoax to gritty cop thriller, Brooklyn’s Finest. 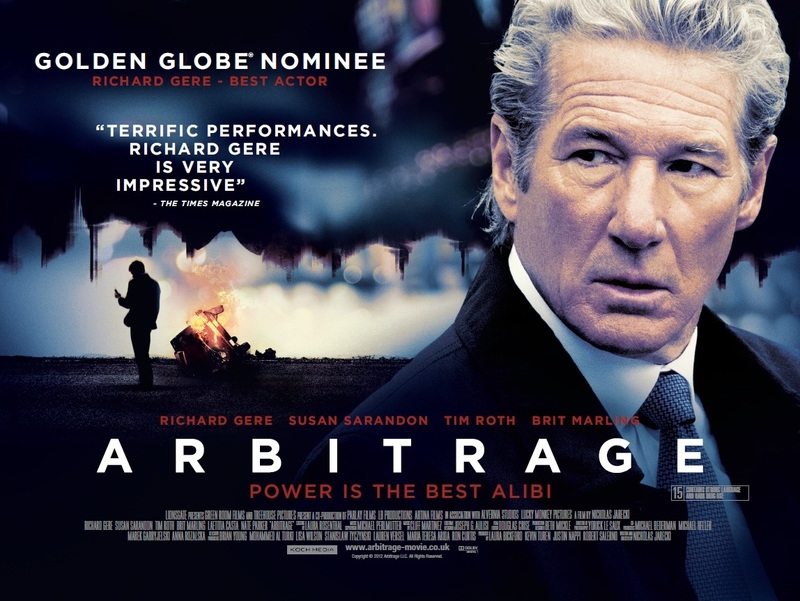 Gere’s latest leading role in feature-film newcomer, Nicholas Jarecki’sArbitrage, maintains this high standard. Arbitrage sees successful businessman Robert Miller (Gere) attempt to cover up fraudulent business activities and personal secrets from his associates and family. However, this grows increasingly difficult after Miller flees the scene of a car-crash that kills his lover, Julie (Laetitia Casta). Both directed and written by Jarecki, Arbitrage proves to be a punchy, fast-paced thriller, remaining tense and gripping throughout. Seeing all facets of Miller’s life gradually spiral out of control, as the businessman continually tries to wind them back in makes for a thoroughly engaging central narrative. As a result of his dishonest behaviour we see his family life crumble – particularly his relationship with his wife (Susan Sarandon), the future of his business come under fire and the eventual death of his lover. Who knew that life in the corporate world could be so exciting? After the death of Julie, Arbitrage becomes an almost cat and mouse like thriller, as the police try and pin the car-crash on Miller. This further amps up the gripping tension and unease that courses through Arbitrage – with the viewer never quite sure if Miller will be caught or convicted. Unfortunately, the narrative power slackens towards the conclusion – with many integral questions going unanswered in a somewhat lazy finale. The role of the troubled Miller allows for Gere to deliver one of his strongest performances in recent years. Seeing the actor as a man out of his depth, yet never willing to accept defeat – even if it means more dishonesty, is one of the endearing qualities of Arbitrage. Gere carries the central narrative with ease, continually reminding us of just how strong an actor he actually is. Susan Sarandon also manages to shine with the smaller supporting role of Ellen, Miller’s wife. Sarandon tackles the role with a subtle emotional power, bringing a sense of dignity and life to the the wife who knows more than she lets on. Further gravitas is added through Tim Roth’s role as Detective Bryer, the man hoping to bring Miller to justice over his crimes. Arbitrage is a taut thriller that holds the viewer in its vice-like grip from the onset with much debt to Richard Gere’s magnificent central performance. Jarecki’s screenplay and direction are largely excellent, even if the conclusion does feel somewhat dissatisfying.